This Milwaukee slide-out utility knife, 48-22-1910, sees a lot of use in my house. I tend to use it for opening new boxes and packages, and my wife seems comfortable using it too. I believe it’s the only utility knife she’ll touch. Despite its somewhat chunky dimensions and non-folding design, it fits in my pocket nicely. I like the blade sliding mechanism, which is on the side of the knife, rather than the top. Maybe Milwaukee will someday come out with a lefty version. Changing blades and accessing the on-board tool storage compartment are both tool-free. There’s a small magnet in the blade storage compartment, a nice touch. The rubbery handle grip, covering the blade change compartment, is getting a bit chewed up on, so I’ll likely buy a replacement and take the current one for workshop use. There are 3 cutting depth positions, and of course a 4th fully retracted setting. I don’t use the cutting slot, but it’s nice to know it’s there. It doesn’t get in my way. There’s not much else that needs to be said. It performs its duties quite well, and is almost a pleasure to use. 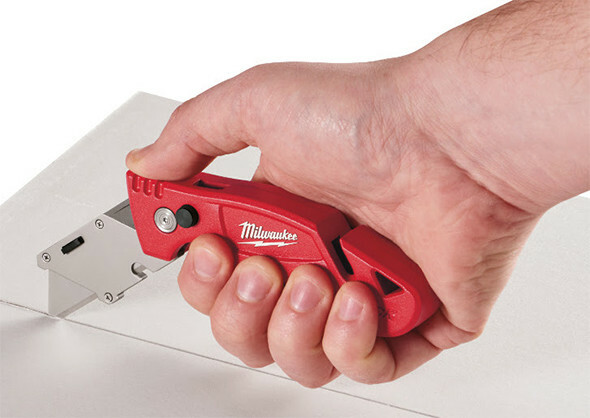 I don’t use this Milwaukee utility knife exclusively, but imagine that I could, for at least all the times I don’t need a more compact folding knife. There’s not much I would want to improve. The blade storage compartment is grasped and pulled to open. Maybe it could be a little more secure? But I haven’t had a problem with it yet. 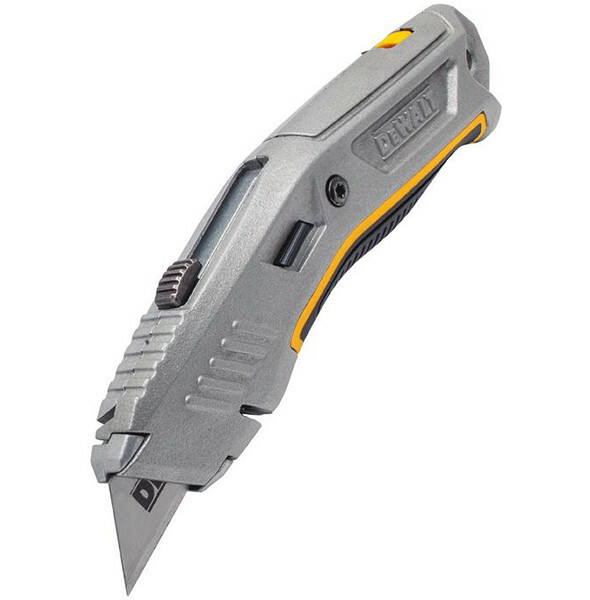 I’d also like to see an ergo-shaped or angled option, similar to some of Dewalt’s utility knives. I’ve rubbed some paint off the front of the knife, but not a lot, so this isn’t a huge deal. Maybe it would help with cutting through difficult materials or unusually thick or tough cardboard. 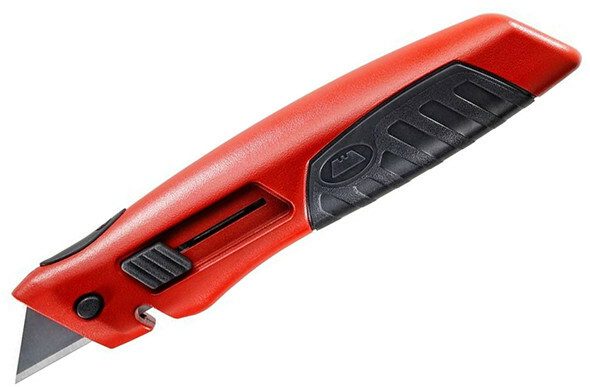 This is a good utility knife at a great price. Question: Retractable vs. Folding Utility Knife Preference? I bought this with a screwdriver as part of a Father’s Day or winter holiday promo bundle at Home Depot. Maybe it was 2 tools for $15? I’d buy more without any hesitation. It lives in a kitchen cabinet, but sometimes follows me around the house or into the workshop in a pocket. I tend to buy new or unfamiliar utility knives, just to try out. This is one of few times that a utility knife impulse buy became a permanent addition to my toolbox. Well, figurative toolbox. New Dewalt Folding Utility Knife, DWHT10916 New Dewalt All-Metal Utility Knife (DWHT10319) Milwaukee Fastback Compact Utility Knife Review and Comparison Where is the Milwaukee Fastback 3 Utility Knife? I’ll second this post! I have at least three of these floating around and find them to be my favorite all-around utility knife. My only warning is that the blade change mechanism gets gummed up and doesn’t work great if the knife gets dirty or filled with Sheetrock dust. So basically take care of your tools? Been using this same knife for a few years now. Defo one of my favs. I’m a fan of this one too. The magnet keeps it attached to my toolbox and out of the way when it’s not in use. Haven’t found much use for the cutting slot either. I may have to give it a try. Too bad it doesn’t seem to have a hole in the handle for hanging or attaching a lanyard. I tend to hang or store knives near their point of use – so I have several. I bought one of the Stanley Safety knives you posted about – and it may be my least favorite – as the blade seems to snap back into the case while I’m cutting – even with my thumb on the slide button. For safety knives – I stick with my Tajima VR-103 that hangs in the garage. I find these posts interesting. Because after using the Fastback, I can’t imagine using another utility knife. I’m assuming it has to be how the tool is used. Since I never used a utility knife for anything where the blade wasn’t fully extended, that’s not a feature that is important to me. I’ve had enough retractable blades get gummed up and stuck that the folding Fastback was perfect. I like the Fastbacks too, but they can be annoying. Flipping the knife open and closing it adds another step that makes long intermittent cutting sessions longer. Cut, stack cardboard, cut, stack cardboard, repeat, is easier with the slide knife. I don’t like leaving open knives out, since I sometimes get interrupted and have to leave things out while I take care of something else. I’ve tried many of Milwaukee’s hand tools and harbor tepid feelings toward them, but this knife is my favorite for heavy use. When you’re using one for extended periods, inattention to blade changes invariably occurs with the resulting increase in pressure to make cuts. That side button and chunky body then really shine in those instances for the harried user. I’ve had one of these for probably 4 years and I truly feel that it is one of those tools that has reached the peak of evolution. It does everything you need so well, there’s really no improving on it. (In spite of that, I epoxied a neodymium magnet to the side of mine). I bought a cheapie with a spring back blade which I have become accustomed too. Don’t think I’ll ever go back to a slider.